Whether racing or trying to pull off the latest tricks and stunts, crashes and spills are always a possibility for BMX riders. High-speed accidents can occur during a race or in practice and, although no rider is immune from injury, damage can be kept to a minimum by observing all the necessary safety measures. Racing pants – Lightweight racing pants tend to be made from nylon or sail cloth materials as these are more difficult to tear. The knee and hip areas should be padded. Of course, jeans or jogging pants can be worn instead, but these do not afford the same level of protection. Racing jersey - Essentially a long-sleeved shirt, but some racing jerseys have padding sown into the elbows. Gloves – Many BMX riders use Moto-X gloves as these provide the best protection. Whatever gloves are chosen, they must cover the entire hand. Shoes – Any flat-soled trainer or tennis-style shoe will provide the necessary adhesion to the pedals. Some experienced riders use clipless shoes and pedals, although these are not recommended for novices. Socks – The minimum requirement is that a rider should wear socks that cover his ankles. 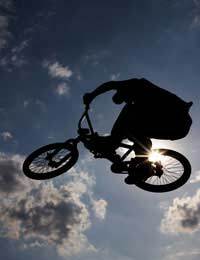 Helmet – Although very similar in design to a Moto-X helmet, a BMX helmet is constructed of lightweight materials. Choose a full-face helmet of a one-piece construction. All this equipment can make BMX an expensive sport for a beginner. Those on a budget should know that many clubs will have second-hand bikes for sale, starting at about £100. Also, you can wear jeans or jogging pants and a long-sleeved top until you can afford a racing jersey and racing pants. Some clubs will have club jerseys for sale, and any gloves that cover the whole hand and all fingers are fine to start with. The race helmet is a very important purchase and not one to be skimped on. It should fit properly, meaning there should be little or no movement when the rider shakes his head. Obviously it can be extremely dangerous if a helmet can slip forward over your eyes while you are riding. The helmet should be lightweight and must not have any cracks. A motorbike helmet is okay, but these are bigger, often heavier and not as sleek in design as the proper BMX ones. A frame and forks the correct size and in good condition, not distorted, cracked or broken. Wheels no larger than 53.3millimetres in diameter. An axle that doesn’t extend more than 6mm beyond the axle nut. Handlebars no wider than 735mm. Brakes that lock the back wheel . Properly inflated tyres with no splits or separations. A Chain and bearings that are oiled or greased and properly tensioned. Pedals that have effective grip. Advices for newbies... USE FREAKING GLOVES!!!! i got blisters!